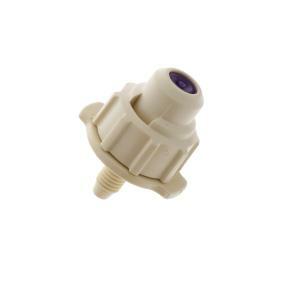 Dig's 3/4 GPH Tan Misting Nozzles on 10-32 Threads provide cooling relief in the hot days of summer by increasing moisture in the surrounding air. Great on patios and decks or around your pool. Misters should be installed at a 120° angle to the ground and spaced 3' - 4' apart. The 10-32 threads are best used in PVC or rigid risers. Operates with common household water pressure between 35 - 80 PSI. The 360° spray pattern covers a 2' - 4' area with 60 - 80 micron sized water droplets.